En Orbita was always intended to be a dialogue between science and music- an expression of how music connects across spaces, cultures… and potentially dimensions. July 15, Le Poisson Rouge in NYC marks the third-ever edition of the festival, with a lineup for the ages. The festival will see performances from none other than the godparents of Latin American Psychedelia, Os Mutantes. Also sharing sounds is the outstanding and recently buzz-heavy Yonatan Gat- the former member of Israeli garage rock outfit Monotonix who recently has been captivating international audiences with his brand of spiritual noise. Martin Rev from the legendary band Suicide will grace the space. Lee Ranaldo and A Place To Bury Strangers represents New York´s noise, Boston-based Chilean band Breaking Forms blesses the stage with what’s been dubbed Bubbly Space Pop, and Tres Warren from the band Psychic Ills is releasing a new project with Berlin based, chilean architect and artist, Alfredo Thiermann called “Land In Sky”. 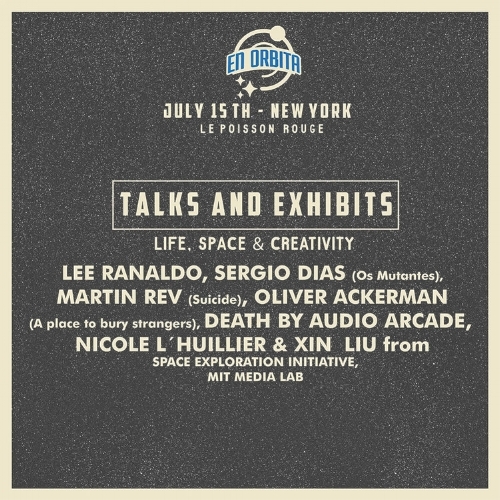 Nicole L’Huillier and Xin Liu, of the group Space Exploration Initiative from MIT Media Lab, will be presenting the work they have done which explores the connections between sound and vision, as well as what human expression means in outer space.